In the early 1900’s, a small nursery known as Brushy Mountain Nursery, located in the North Carolina foothills of the Blue Ridge mountains, sold an apple tree with the unusual name of Mongolian. 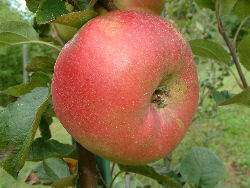 It was a large to very large flat apple with very waxy skin and was described as the “reddest red you have ever seen”. In 2000, renown apple hunter, Tom Brown, learned that there might be several old Mongolian trees at the old Fortner home place near the Wilkes/Alexander county line in North Carolina. After initial investigations, Tom discovered that these old trees had recently been bulldozed in a land-clearing operation. Two years later, Tom was introduced to a lady who had numerous old apple trees on her property including one she called the “Clothes Line” apple. The Clothes Line “tree” consisted of a single limb which had been grafted onto an older tree and which extended out over her clothes line. Upon seeing a handful of the apples, Tom suspected this could be the rare Mongolian. After showing the fruit to several Fortner family members, Tom was able to confirm the identity of this lost apple.